Summary: Changing tasks too frequently interferes with brain activity, a new study reports. The brain works most efficiently when it can focus on a single task for a longer period of time. Previous research shows that multitasking, which means performing several tasks at the same time, reduces productivity by as much as 40%. Now a group of researchers specialising in brain imaging has found that changing tasks too frequently interferes with brain activity. This may explain why the end result is worse than when a person focuses on one task at a time. ‘We used functional magnetic resonance imaging to measure different brain areas of our research subjects while they watched short segments of the Star Wars, Indiana Jones and James Bond movies,’ explains Aalto University Associate Professor Iiro Jääskeläinen. The impact of a short segment of Indiana Jones movie on the diverse areas of the brain. NeuroscienceNews.com image is credited to Juha Lahnakoski. Cutting the films into segments of approximately 50 seconds fragmented their continuity. In the study, the subjects’ brain areas functioned more smoothly when they watched the films in segments of 6.5 minutes. The posterior temporal and dorsomedial prefrontal cortices, the cerebellum and dorsal precuneus are the most important areas of the brain in terms of combining individual events into coherent event sequences. These areas of the brain make it possible to turn fragments into complete entities. According to the study, these brain regions work more efficiently when it can deal with one task at a time. Jääskeläinen recommends completing one task each day rather than working on a dozen of different tasks simultaneously. The subjects’ brain areas functioned more smoothly when they watched the films in longer segments. Credit: Juha Lahnakoski. ‘It’s easy to fall into the trap of multitasking. In that case, it seems like there is little real progress and this leads to a feeling of inadequacy. Concentration decreases, which causes stress. Prolonged stress hinders thinking and memory,’ says Jääskeläinen. The neuroscientist also sees social media as a challenge. In addition to Jääskeläinen, Juha Lahnakoski from Max Planck Institute, Mikko Sams from Aalto University and Lauri Nummenmaa from the University of Turku participated in the research. Image Source: NeuroscienceNews.com images are credited to Juha Lahnakoski. Aalto University “Multitasking Overloads the Brain.” NeuroscienceNews. NeuroscienceNews, 28 April 2017. Aalto University “Multitasking Overloads the Brain.” http://neurosciencenews.com/multitasking-brain-overload-6531/ (accessed April 28, 2017). To understand temporally extended events, the human brain needs to accumulate information continuously across time. Interruptions that require switching of attention to other event sequences disrupt this process. To reveal neural mechanisms supporting integration of event information, we measured brain activity with functional magnetic resonance imaging (fMRI) from 18 participants while they viewed 6.5-minute excerpts from three movies (i) consecutively and (ii) as interleaved segments of approximately 50-s in duration. We measured inter-subject reliability of brain activity by calculating inter-subject correlations (ISC) of fMRI signals and analyzed activation timecourses with a general linear model (GLM). Interleaving decreased the ISC in posterior temporal lobes, medial prefrontal cortex, superior precuneus, medial occipital cortex, and cerebellum. 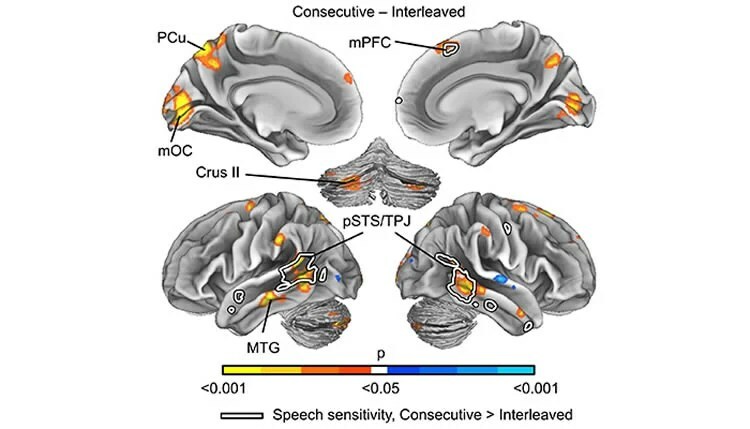 In the GLM analyses, posterior temporal lobes were activated more consistently by instances of speech when the movies were viewed consecutively than as interleaved segments. By contrast, low-level auditory and visual stimulus features and editing boundaries caused similar activity patterns in both conditions. In the medial occipital cortex, decreases in ISC were seen in short bursts throughout the movie clips. By contrast, the other areas showed longer-lasting differences in ISC during isolated scenes depicting socially-relevant and suspenseful content, such as deception or inter-subject conflict. The areas in the posterior temporal lobes also showed sustained activity during continuous actions and were deactivated when actions ended at scene boundaries. Our results suggest that the posterior temporal and dorsomedial prefrontal cortices, as well as the cerebellum and dorsal precuneus, support integration of events into coherent event sequences.